This photo shows the inside of the European Court of Human Rights in Strasbourg, eastern France, Feb. 7, 2019. The European Court of Human Rights has dealt Turkish human rights activists a significant blow in its refusal to hear a pivotal case stemming from a Turkish military operation that left more than 100 civilians dead. The military campaign took place in Turkey's predominantly Kurdish southeast between December 2015 and February 2016 as the security forces sought to oust PKK separatist fighters from towns and cities across the region. 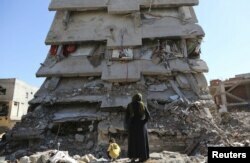 The European Court cases focused on Cizre, the scene of some of the heaviest fighting. U.S.-based Human Rights Watch said Turkish security forces "deliberately and unjustifiably killed about 130 people — among whom were unarmed civilians and injured combatants — trapped in the basements." Ankara strongly condemned the allegations, maintaining that civilians were not deliberately killed. Two civilians, Orhan Tunc and Omer Elci, were among the casualties in Cizre. Last Thursday, the court ruled that their cases were inadmissible because all "domestic remedies" had not been exhausted. That means lawyers had not taken their case to Turkey's Constitutional Court. The decision is a crucial legal victory for Ankara, but casts a shadow in the minds of many in Turkey over the integrity of the European court. "Human rights groups documented unlawful and mass killings, destruction of property and displacement, and so far there has been no effective criminal investigation into any aspect of what occurred," said Turkey senior researcher Emma Sinclair-Webb of Human Rights Watch. FILE - A woman looks at a building, which was damaged during the security operations and clashes between Turkish security forces and Kurdish militants, in the southeastern town of Cizre in Sirnak province, Turkey, March 2, 2016. Lawyer Ramazan Demir, representing Orhan Tunc, whose burned remains were found with his brother Mehmet in Cizre, said the case was the last hope for legal redress. "They (families of the killed) were hoping that the (European) Court would rule on the facts of mass crimes committed by security forces. They are abandoned to Turkish judiciary once again by the court." The court's rejection of the cases validates Ankara's argument the Turkish judiciary remains independent and functioning, according to analysts who say the ruling will also likely end hopes of dozens more similar pending cases. "The European Court of Human Rights has become an apologist for the Turkish Constitutional Court, claiming that the Turkish Court provides an effective remedy," tweeted law professor Yaman Akdeniz and freedom of speech activists. "In the history of the republic, it has never witnessed such demise of the judiciary independence," said political scientist Cengiz Aktar. "The judiciary was always under the heavy influence of the executive, but never at the level, we are witnessing now. The regime is installing a new concept of law in Turkey." The mass arrests and dismissals within the judiciary and the Turkish presidency's greater powers to appoint high-level judges, including to the constitutional court, are adding to growing pressure on the European Human Rights Court to accept cases without going through the Turkish legal process. This is a power the European court has seldomly used. Analysts warn such a move threatens to bring the court to a standstill. "There are so many violations (in Turkey) of the European Convention of Human Rights, if the courts accepted all those cases it would be overwhelmed," said Aktar, adding, "It would stop the work of the court. This is why the court is so careful in accepting cases." Aktar points out it's essential to understand the court's limitations. "The European Court of Human rights is not a tribunal to ensure the change of non-democratic countries into democratic ones," said Aktar. "The court is conceived to redress of small deviations from the rule of law. In Turkey, Azerbaijan and Russia, these are non-democratic countries. The court can't help there." Demir said he fears the door is closing on the last hope of legal redress for victims of injustice in Turkey. "The court has always been final hope for the victims," said Demir. "However, they (Court) prefer not to disappoint the (member) states nowadays..."